This new audio plugin for Calf Studio Gear provides a simple implementation of the RIAA curve filter applied to LP records after the turntable has picked up the sound. At the leading recording studios where records are cut, the bass is reduced and the treble boosted before an LP is created. Inside each phono preamp is the inverse of this filter to counteract the effect of the altered sound. I have implemented this filter here. Therefore, anyone with a decent turntable and soundcard can use this plugin to digitize their old collection of LPs. This plugin is now part of calf. 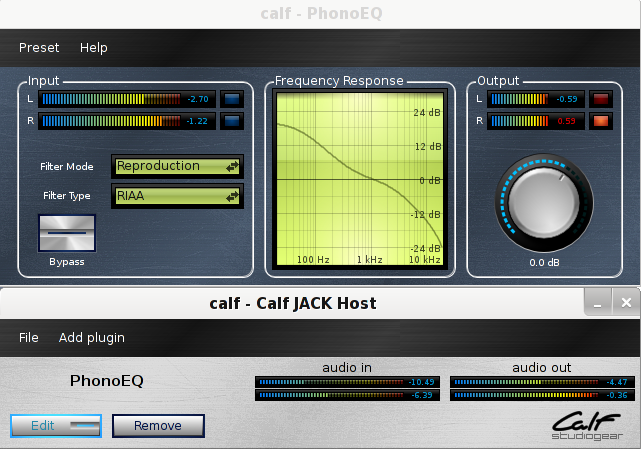 This is a very valuable and rare plugin, it’s known now as Calf Emphasis, as it also has some more curves available,.